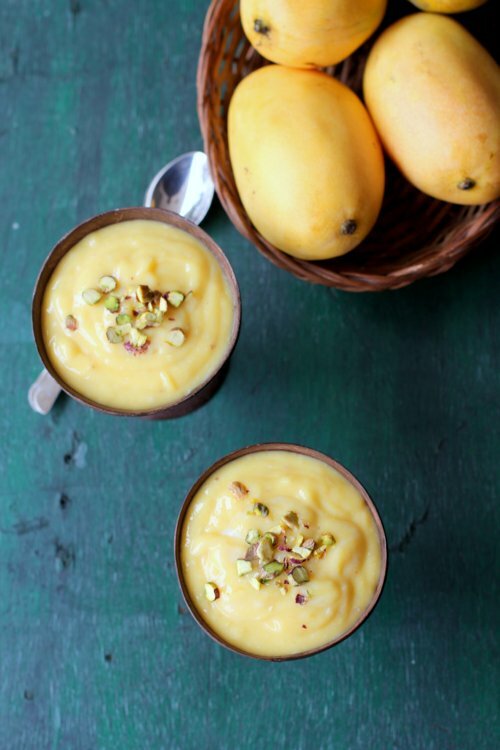 Mango phirni is an ultimate comfort dessert in a bowl. A fantastically rich, creamy, silky smooth pudding that is popular as aam ki phirni in North India. Phirni is a festive sweet dish prepared with full fat milk, fragrant rice like basmati, sugar and cardamom. The main star of today’s easy mango dessert is fresh mango puree which is added to the basic phirni recipe lending it a fruity sweetness. The mango phirni recipe starts by boiling milk till it reduces to three fourth of its original quantity. Soaked raw rice paste that is diluted in milk is slowly added to the simmering milk and constantly stirred till the mixture is cooked through and thickens. Sugar, almond paste and cardamom are added in the final stage and cooked for a couple of more minutes. Once this mixture comes to room temperature, fresh mango puree is added and mixed to combine to a smooth consistency. It can eaten either warm or chilled. I like to serve chilled mango phirni that’s garnished with chopped pistachios. 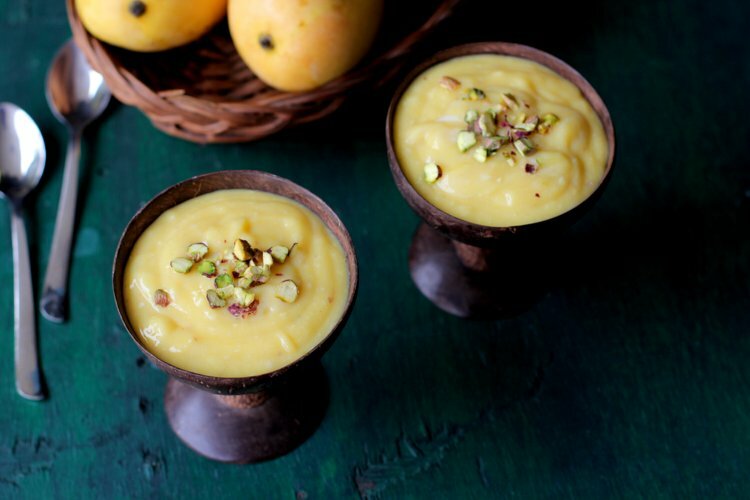 Soaked raw rice paste lends a really rich, creamy consistency to this phirni aka mango pudding. The simmering pudding has an aroma that is intoxicating due to the use of basmati rice. This eggless mango dessert is by no means overly sweet and the flavor of cardamom cuts through the richness of the mango phirni. Mango phirni is one of the best Indian mango dessert to make for festivals like Ramzan or birthday celebrations. 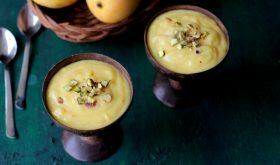 And if you are looking for an eggless Indian dessert to make for your next party, do try this deliciously decandent chilled mango dessert in a bowl. Bring the milk to a boil in a heavy bottomed vessel. Simmer till it reduces to 3/4 th of its original quantity. While the milk is simmering, drain the soaked basmati rice and grind to a fine paste by adding 1/2 cup of the boiled milk. Remove to a vessel and set aside. After the milk has reduced to 3/4th of its original quantity, slowly add the ground rice mixture and keep on stirring till it blends well into the milk and it starts to thicken. Keep on stirring so that the bottom does not burn. The stirring could take anytime between 12-15 mts. Add almond paste, cardamom powder and sugar and continue to stir till the sugar dissolves and it forms a nice creamy mixture with no lumps. Turn off flame and allow to come to room temperature. Add the mango puree to the phirni mixture and mix well. Remove to a serving bowl and chill until serving time. 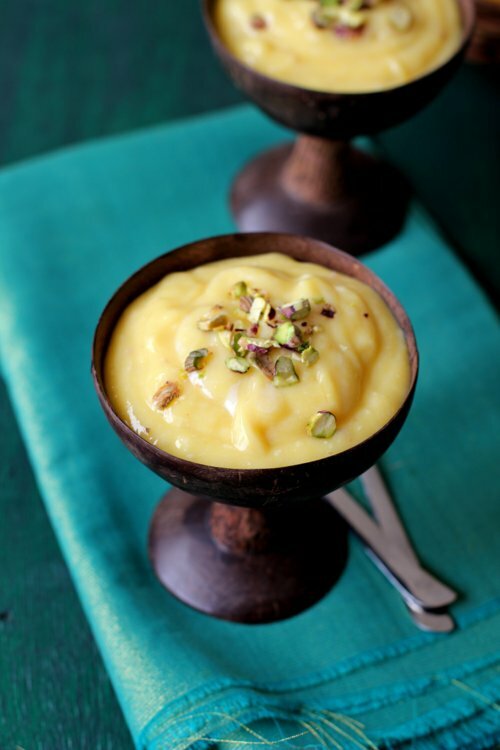 At the time of serving, ladle the phirni into serving bowls, garnish with chopped pistachios. Adjust sugar according to the sweetness of mangoes. If using saffron, add it to the milk mixture at the time of adding cardamom powder. If your phirni has turned too thick, you can loosen it have adding a few tbsps of boiled milk. If using saffron, add it at Step 4. By Sailu Published: July 12, 2015 Mango phirni or aam ki phirni recipe, Indian mango dessert made with mango puree, raw rice & milk. How to make mango phirni, creamy like kheer or payasam. First of all thank you for sharing this recipe here as I ever encounter such one. It is indeed new to me. 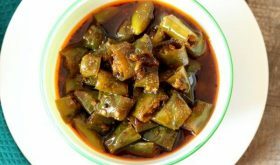 You also mention that it is not more sweet in taste so would like to try it once. If I add chocolate or ice cream at the end of the recipe, will it be enhance its taste? Kindly share your view about the same. Hey sailu…have become a complete fan of your cooking..I am an amateur wen it comes to cooking especially vegetarian food..I followed some of your recipes and my family absolutely loved it..will keep on trying your other recipes as well..I have definitely found a difference in your recipes when compared to the numerous recipe blogs out ther….kudoss and continue ur gud work !!! !